New Delhi, 06 June: Muslims of the country are worried about the illegal occupation of their Waqf properties around the country and the government’s disregard about it whereby more and more cases of embezzlement of some Waqf land and illegal occupations are coming to light slowly every day. It is only a few cases of such embezzlement has come to light but in reality the list is very long. During the last few weeks Daily Qaumi Salamti has after investigation brought to the public notice occupations of Waqf properties and embezzlements therein and has brought to light the sale through builder’s mafia of land in Mahroli with registration No. 1151/2 for Rs 4.75 crores. Although roots of embezzlement of Waqf properties go very deep but the investigative team of Daily Qaumi Salamti by their continued investigative efforts and through conjectures and evidences with the help of those who are in the know is striving hard to reveal such embezzlements. Recently the information that has come to the knowledge of Qaumi Salamti about Waqf property in southern Delhi’s Malvia Nagar is not only startling and also highly worrying. Everyone knows that our great and noble Muslim ancestors and benefactors had only left their properties in trusts only to be used for the benefit and relief of the poor and needy of Muslim community but the situation today is that using such properties for the benefit of the poor and the needy is a distant call, the Waqf Board after renting out these properties seems not even remotely concerned whether the Waqf lands are being used within the perimeter of Shariah limits or not. Instead Waqf contractors are only concerned that whether the properties are bringing them peanut worth rents in return or not. There are strong possibilities that those who are responsible for the affairs of the Waqf are getting their pockets filled in return of letting the properties at a cheap rent. Investigation in this respect is going on. Latest investigations reveal that in Malvia Nagar, the southern district of southern Delhi ‘Panchsheela Randhava’ restaurant established at the Waqf land is also the victim of Waqf Board’s connivance. Due to the negligence and carelessness of the Waqf Board this grand restaurant with wine bar near the mausoleum of Sheikh Kabeer-ud-din Aulia and adjacent to Lal Gumbad is established on the vast sanctified Waqf land In Mohallah Sheikh Sarai of Malvia Nagar and hosts wine, women, music and dance parties and thus is taunting and challenging the religious feelings of Muslims. ‘Panchsheela Randhava’ restaurant is established on the land registration No. 487/53439 by the main roadside in Mohallah Sheikh Sarai in Malvia Nagar and welcomes not only the wayward children of the rich and noble but also the common man. Loaded with the comforts and luxuries this restaurant provides all the facilities that is required to cater for the lewd luxuries that is requisite for any five star culture. The minimum daily taking of this restaurant is five lac of Rs. It is very startling to know that this restaurant pays Waqf Board only 46 thousand Rs monthly as rent and those responsible for the Waqf Board are happy with it. Previously the rent was 21 thousand Rs. This restaurant was established in 1991 by one named Arvind Ghaee . Due to its high standard it has gained prestige and renown and thus it takes pride in playing host to foreign tourists as well as delegates of famous companies. It is therefore very attractive to foreign tourists. Some of the halls in it are so big that thousands of guests can be accommodated at one time. This is how that Panchsheela restaurant despite paying small rent to the Waqf Board is able carry on its un-Islamic activities there in. Recently when the investigative team of ‘Qaumi Salamti’ arrived at ‘Panchsheela Randhava’ restaurant it was quite amazing to see that at the very gate the welcoming security personnel took the team’s car in their own charge to park so that the guests could enter the restaurant without any delay or hindrance. This kind of facility is usually not available even to the visitors in all five star hotels. Inside the restaurant especially well trained staff stands alert all the time from guiding guests to their seats to payment of their bills. During this visit one of the hotel’s staff told us that usually number of guests is so great that newcomers face difficulty in finding space to sit. He also informed that restaurant’s owner Arvind Ghaee has three sons who look after the management of the hotel and that he also owns many big hotels in Delhi and soon he is going to open another restaurant on this land. The investigative team then went to booking office and enquired for booking for a party of two hundred guests sometime about a month later. They were told that for the next one and a half month it was impossible to have any booking at all because all the dates had been booked already. 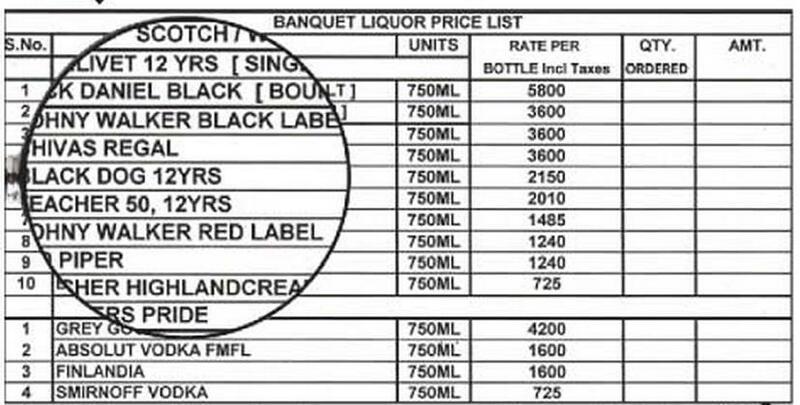 When asked about per head charges the team was informed that per head dinner charges with taxes would be Rs two thousand and twenty six. With that the manager provided us a printed list of different wines and its price list in case required more expensive wines and beers could be served. 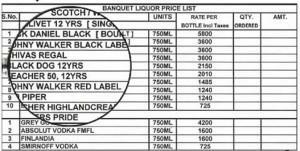 In the list most expensive bottle was priced as Five thousand and eight hundred Rs per bottle. The restaurant also provides a list of food and wine in the form of a menu of which a copy was not possible to get while in the presence of workers. In Panchsheela Randhava Cafe that is run under the management of Eastern Hospitalities Limited Company, besides Soribachi Restaurant and a cafe there are large dining halls namely Jewel, Chrystal and Offera Lounge. Interesting thing is that at the rear end of this huge building there is a parking lot that can accommodate at least 100 motor cars which is a facility that in present circumstances is very rarely found in a city like Delhi. 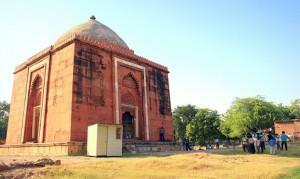 According to the law running a restaurant near any relic that is considered a national heritage cannot be allowed whereas this restaurant is situated adjacent to the tomb of Kabeer-ud-din Aulia which is generally known as Lal Gumbad (Red Dome). An employee of Waqf Board under the condition of anonymity told us that ‘because it brings ‘quite a good rent’ therefore the Waqf management is not seriously concerned about alcohol being served there and considering the business of this hotel, restaurant and banqueting hall spread over this piece of land that covers about seven bighas of area its monthly rent even of five lac of Rs is a peanut. However despite anti Shariah business there and the premises rented at a very meagre rent the Waqf Board and its patron Delhi government both have had their eyes closed. Now the question arises that whether the Waqf Board has knowingly ignored the anti-Shariah business at the Waqf land or it is being done under some expedience? In any case what is very evident is the fact that the Waqf Board by renting out this huge piece of land at a measly monthly rent and letting it being used for anti Shariah business is earning a bad name for the religion of Islam at one hand and usurping the rights of the poor, needy and the widows at the other. Ahmed Patel: A friend of Muslims or an enemy?